I had to take The Little Mister to the GP yesterday as he had a nasty cough. 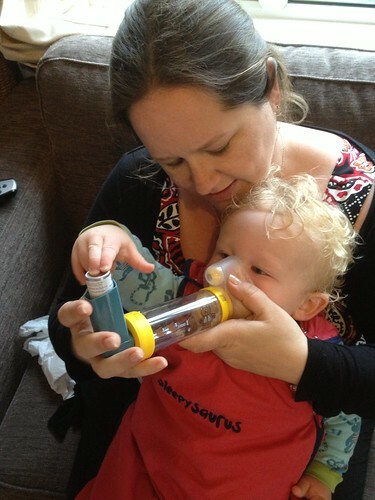 The GP said that it sounded like a croupy cough but he was also quite wheezy. A couple of nights ago he sounded like he was smoking about 40 cigarettes a day! He has been given antibiotics but also this inhaler to see if it clears up the wheeze. Hopefully he won’t need to use it long-term. He has been a really good boy with it and hopefully it will clear his nasty cough up quickly. 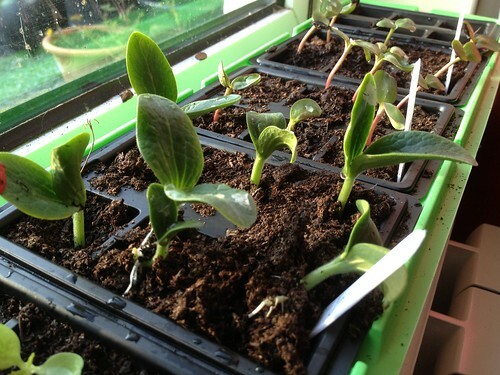 My seeds are springing to life on the windowsill of our spare room. I find it fascinating to see them popping up and growing towards the light. Soon I will be able to re-pot them into bigger pots and then they will be able to go in the veg patch. Then I shall pray over them to be ‘fruitful’. I am very Godly when it comes to fruit and veg growing. Just a quick photo tonight as I am absolutely shattered after a long day. We had an early start, leaving the hotel at 8am to get to the airport for our flight. I then went straight to work. To say I am feeling tired is an understatement. I thought I had taken a few photos today but it would appear that I was extremely slack and took absolutely none at all! 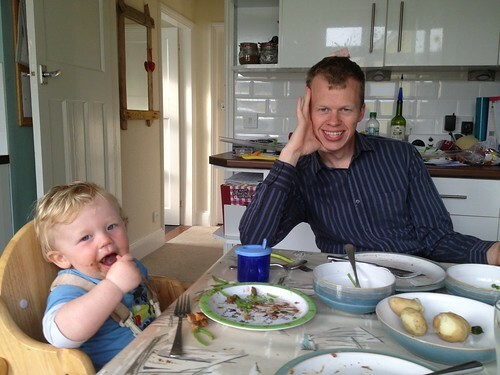 I am happy to be home seeing my two lovely boys. Great trip away Bel Canto girls… we must do it again!! On Saturday 27 April the choir I sing in, Bel Canto, travelled to Basingstoke to compete in the the Choir of the Year 2014 competition. Letting 21 girls, one conductor and one pianist free with no husbands, partners or children is a dangerous thing. However, we all returned unscathed! We flew to Southampton and got coaches to Basingstoke before being let loose on the shops for a short hour or so before we had to return to The Anvil to prepare to perform. The competition was made up of four different categories; Children, Youth, Adult and Open. We were performing in the Adult category, and Guernsey Girls Choir, which is the choir most of us were in originally, was in the Youth Category. At each session they put through one choir from each category to selection for the next round. We performed Hilariter by Brian Hughes, She’s Like the Swallow by Edward T. Chapman and The Old Ark’s A-Movin, arranged by Robert Latham. The adjudicators gave us some really positive feedback and were very encouraging. The competition really varied and the choirs were so different. 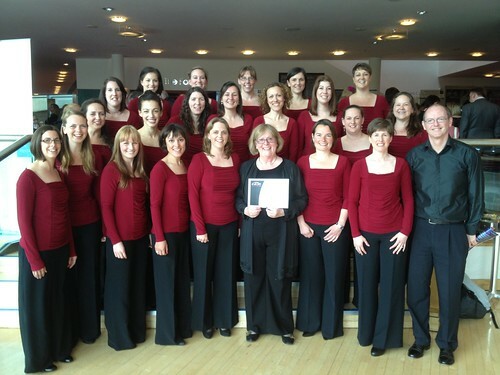 We were delighted to be made the Adult Choir of the Day so we have been put through for selection to the next round. It doesn’t mean we go through, just that we are in the running. This picture is of us with our certificate. Our evening ended up with a nice meal at the hotel although the meal was typically raucous. It was a brilliant day and we really enjoyed seeing different choirs perform as well as the chance to spend some proper time together. I still think that it is funny that I have been singing with some of the these girls for over 20 years and we are still enjoying ourselves. That’s got to be a good advert for singing in a choir! Our garden is springing to life all over the place. 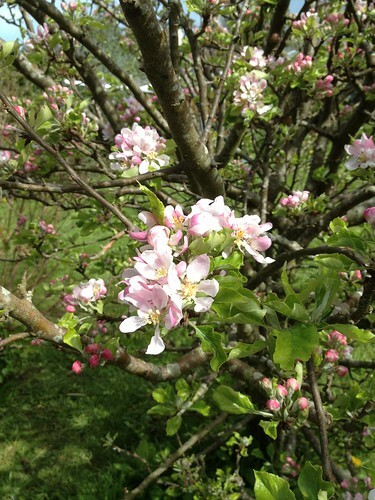 Our very productive apple tree is producing beautiful blossom promising plenty of fruit in the future I hope. I thought we might get to spend a bit more time on the vegetable patch today but the weather has been pretty awful. We just about managed to plant the loganberry and raspberry plants before the heavens opened. So, what to plant next? It’s all very exciting! I am really tired this morning as we have had a busy day seeing friends and taking The Little Mister swimming. This is the only photo I took today. I went to the NCT sale this evening and bought a few bits and bobs, including some really cute girly bits. 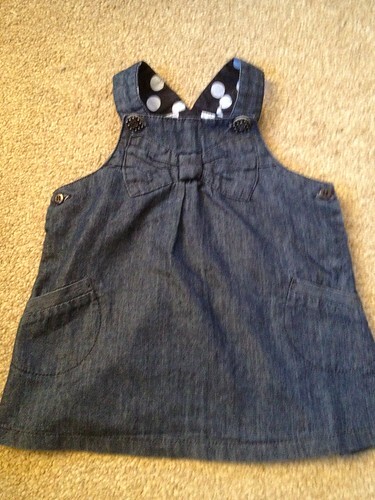 This sweet, soft denim pinafore was one of the bits I bought. It’s lovely and so exciting! Today our very lovely surprise present from my Dad arrived. He has bought us a big 8-seater picnic table for our patio. I have been wanting one for ages and he couldn’t have bought us a more useful present if he’d tried!! 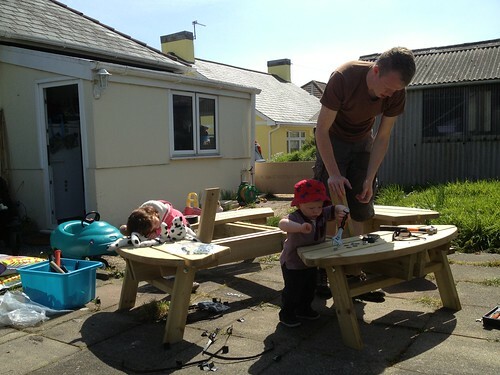 Here is The Mister attempting to put it together with his little ‘helpers’ who were rather less than helpful! This morning The Little Mister and I went to my aunt’s house where we met with my sister and her kids and my other aunt and her grand-daughter. 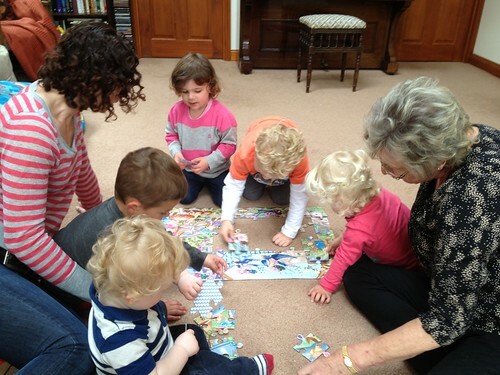 It was a little bit like a creche! It was lovely to be off work today so that I could go and spend some time with my family. I appreciate so much having my family around me and they are extremely supportive and they make good cake! We had planned to go to Herm today but the weather was really ropey so we made the very sensible decision to not go – fortunate as it drizzled on an off all over lunchtime! 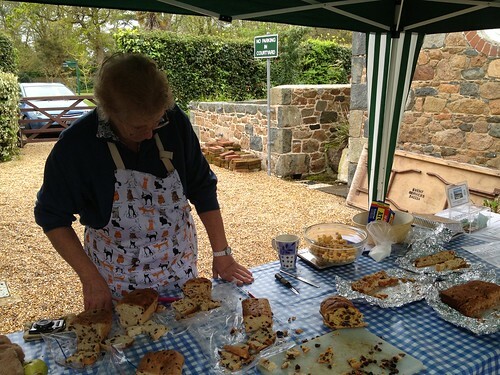 Instead we went to Sausmarez Park as the museum there had an open day so entry was free, there people people there demonstrating various traditional crafts and most importantly there was a Guernsey gache tasting stall. It was lovely to spend the afternoon with my sister and the kids and it was really entertaining to watch the cousins running about together. Their relationship and friendships are becoming so interesting and strong. It is a real pleasure to see. We have had a lovely quiet Easter Monday. 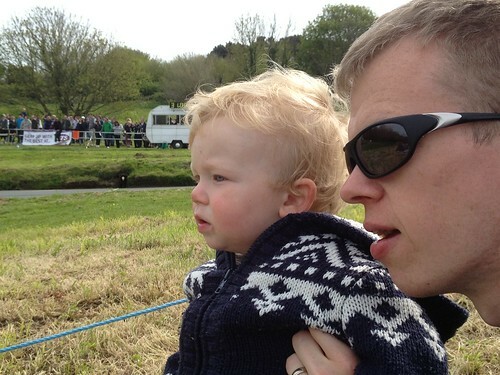 We saw my cousin and his family this morning and this afternoon we went to the Hill Climb. The Little Mister really enjoyed seeing the cars zooming up the hill but got bored with the waiting around bits in between. Love my boys. They make me smile so much.